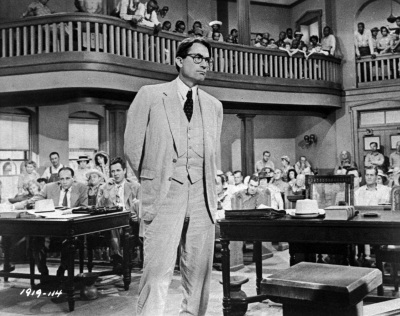 Atticus Finch, the main character of Harper Lee’s brilliant To Kill a Mockingbird, is one of the most beloved heroes of all time. Exhibiting integrity, honesty, wisdom and a true sense of color blindness, the character inspired an entire generation of young men and women to become lawyers for the right reasons. Atticus has long endured as an example of humanity at its best. That is why the release of Go Set a Watchman, the novel that takes place after Mockingbird but was written prior to it, has so many Atticus acolytes up in arms and crying into their beers. The Atticus of Watchman is an idol with feet of clay, a man who, while he believes in justice and liberty, doesn’t necessarily believe that liberty should extend to everyone in the same way. 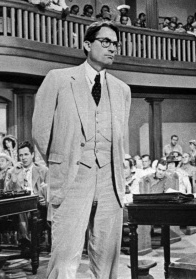 To find that the “you-can’t-judge-a man-until-you-walk-in-his-shoes” Atticus does indeed judge men by the color of their skin is mind-blowing and goes against everything you thought about the man. But. Go Set a Watchman, while being marketed as a sequel to To Kill a Mockingbird, really, in my mind, is not. Certainly there are some of the same characters; the main character — the lovable, irrepressible Scout — is now a grown woman, Jean Louise, returning to her Alabama hometown to find that things are not what they seemed when she was a child. But the masterful Mockingbird is so much more of a riveting, moving story, rich with wonderful writing and unforgettable characters. Watchman, while a good read, not so much. So, to all Atticus adorers, take heart. Yes, the Atticus of Mockingbird is race-blind while the Atticus of Watchman is racist. But if you look at these two novels as totally separate from each other, then there is no reason to despair about the demise of our hero. Enjoy Go Set a Watchman for the novel it is (and for the first draft of these characters before they found their true lives in To Kill a Mockingbird). And don’t cry for Atticus. True. But in the escapism of reading, everyone wants Atticus Finch the way he is. And that’s okay. ← is that a brisket in your basket? You didn’t think that it was didactic and tedious? I thought that it needed some serious editing and focus. At the end when the uncle reveals that the whole point was to see when Jean Louise (how I despise that name!) will separate herself from her father’s ideals, I thought, John Updike does that in three pages in his story “A&P.” When I finished it (had to read it for book club) I thought, there’s a first novel that should have stayed in the drawer. I thought that if you read it as a first novel — even a first draft of Mockingbird — you can see how the story developed, re-developed, and, finally turned out to be what I consider one of the finest pieces of literature ever written (Mockingbird, that is). I feel like Watchman was training for Harper Lee both as a writer and storyteller. Thanks for reading my blog!